The Kadampa (Bka’-gdams-pa) Tradition was a Tibetan Mahayana Buddhist school. The disciple of the great Indian Buddhist Master Atisha (982 — 1054) Dromtönpa — a Tibetan lay master — founded it and passed three lineages to his disciples. The Kadampas were quite famous and respected for their proper and earnest Dharma practice. The most evident teachings of that tradition were the teachings on Bodichitta (later these special presentations became known as Lojong (Blo-ljong)) and Lamrim (Stages of the Path) by Atisha. All of the other three Tibetan Buddhist schools (Nyingma, Sakya, Kagyu) also integrated the Lojong (Blo-sbyong) teachings into their lineages. Gampopa (Sgam-po-pa), who studied for six years within the Kadampa Tradition and became later the main disciple of Milarepa (Mi-la ras-pa), included the Lojong and Lamrim teachings in his lineage, the Karma Kagyu (Ka-rma Bka’-brgyud) Lineage. Nowadays the Gelug Tradition keeps and transmits the Kadampa-lineage of the Scriptural Traditions of the Six Canonical Texts. Together with Dagpo Kagyu Tradition they keep and transmit The Pith Instructions of the Sixteen Essences, and the Dagpo Kagyu Tradition keeps and transmits the Key Instructions of the Four Noble Truths. After the death of Atisha (1054) his main disciple Lama Dromtonpa (Drom-tön Gyal-we Jungne, 1005 — 1054) organized his transmissions into the legacy known as «The Four Divinities and Three Dharmas» — a tradition whereby an individual practitioner could perceive all doctrines of the sutras and tantras as non-contradictory and could personally apply them all as complementary methods for the accomplishment of enlightenment. Eventually this lineage came to be known as Atisha’s Kadam Tradition, the Marvellous Legacy of Seven Divine Dharmas. Lama Dromtonpa transmitted the various lineages of Atisha by dividing them between The Three Noble Brothers. To one he gave the scriptural traditions, to the second the oral transmissions, and to the third the pith instructions. The Three Noble Brothers are: Geshe Potowa, Geshe Phuchungwa and Geshe Chenngawa. Geshe Potowa (1031-1106) received the entire scriptural teachings and hidden verbal transmission of both sutra and tantra from Dromtonpa. The scriptural traditions were of two main types: those dealing with ultimate reality and the wisdom of emptiness; and those dealing with conventional reality and the vast Bodhimind (Skt. Bodhicitta) activities. As for the former of these, or those dealing with the ultimate wisdom of emptiness, the principal texts stressed here were Nagarjuna’s six treatises on emptiness philosophy, such as The Root of Wisdom (Skt. Mulamadhyamikakarika) and so forth, together with the commentaries to them by the later Indian masters; and also Atisha’s own commentaries on the middle view and on the nature of the two truths. Six quintessential texts were used to elucidate the nature of the bodhisattva’s vast activities: The Bodhisattva Stages (Skt. Bodhisattvabhumi) by Asanga; An Ornament of the Mahayana Sutras (Skt. Mahayanasutraalamkara) by Maitreya/Asanga; A Compendium of Bodhisattva Trainings (Skt. Shikshasamucchaya) by Shantideva; A Guide to the Bodhisattva Way (Skt. Bodhisattvacharyaavatara) by Shantideva; A Garland of Birth Stories (Skt. Jatakamala) by Aryasura, and The Collected Sayings of the Buddha (Skt. Udanavarga) — the Tibetan Dhammapada by Dharmatrata. It is the tradition to read at the Great Prayer Festival (Mönlam) the fifth of these, A Garland of Birth Stories, during the morning session. These were the principal scriptures studied in the Old Kadam School.As for the oral transmission teachings, these emanated from and were the essential practices taught in the five scriptures mentioned above. These oral tradition teachings are generally known as «The Instructions for Training the Mind in the Mahayana Tradition» (Tib., Theg-chen-blo-sbyong-gi-gdampa-pa).Atisha had collected these Lojong Teachings from his three principal Indian gurus (from his Master Dharmakirti (also known as Serlingpa or Suvarnadvipa), Guru Dharmarakshita and Yogi Maitreya) and later he secretly transmitted them to his main disciple, Lama Dromtonpa. 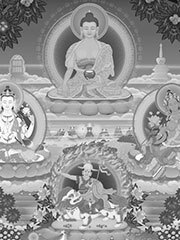 During the time of The Three Noble Kadampa Brothers many of these oral teachings were collected together and compiled into the text Stages of the Doctrine (Lamrim; tib. : sTan-rim). Yet at the time the lineages from Atisha’s Indonesian master Serlingpa (the Lojong — Teachings on how to train in Bodhichitta) were still kept secret. When the time was sufficiently mature the Lojong Teachings were publicly revealed. First Geshe Kham Lungpa published Eight Sessions for Training the Mind (Tib., bLo-sbyong-thun-brgyad-ma), then Geshe Langri Tangpa (1054-1123) wrote Eight Verses for Training the Mind (Tib., bLo-sbyong-tshig-brgyad-ma). After this Sangye Gompa composed A Public Explanation (Tib., Tshogs-bshad-ma) and Geshe Chekhawa (1102-1176) wrote Seven Points for Training the Mind (Tib., bLo-sbyong-don-bdun-ma). In this manner, the Lojong Oral Transmission Teachings gradually emerged and became known to the public. Before being revealed, the secret lineage was as follows: Serlingpa-> Atisha-> Dromtönpa -> Potowa -> Sharawa (1070-1141) -> Chekhawa (1101-1175). From Khamlungpa, Langri Tangpa and basically Chekhawa onwards they became public and later they were integrated into all four Tibetan Buddhist Schools. (These Kadampa-Lojong texts were brought together into the anthology A Hundred Texts on Training the Mind (Tib. bLo-byong-brgya-rtsa)). The third lineage – the pith instructions, transmitted by Lama Dromtonpa, has its root in the secret oral teachings of Atisha and his disciples as embodied in The Great Book of the Kadampa Masters: A Jewel Rosary of Profound Instructions on the Bodhisattva Way. The Kadam Tradition has mainly emphasised the Sutra Path (The Union of Compassion and Wisdom). The Kadampa Lineage is also summarized by «The Teachings Of The Four Divinities and Three Dharmas That Adorn The Body», «The Three Containers That Adorn The Speech» and «The Three Disciplines That Adorn The Consciousness». In the 1990s, Geshe Kelsang Gyatso (Dge-shes Bskal-bzang Rgya-mtsho), a monk trained at Sera Monastery, a Gelug university, founded a new western organisation which he named the «New Kadampa Tradition.» The NKT claims to follow the Kadampa tradition, but many Tibetan Buddhists dispute this contention; please see New Kadampa Tradition for further discussion.